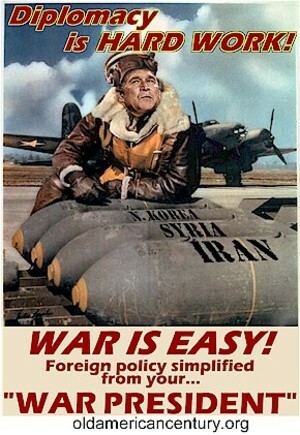 OlsonOnline: "Diplomacy is hard, war is easy"
"Diplomacy is hard, war is easy"
If a picture, or image, is worth a thousand words, maybe this should have been yesterday's post. However... there's still the issue of "liberal hawks", like Hillary Clinton, who seem to believe that easy is better than hard. Or that saber rattling makes for a better campaign platform than principled pacifism.